Stay active in the cold this winter in the Active Revelstoke Warm SUW long sleeve crew neck top for men. Ski harder for longer in this insulated top that keeps you warm while wicking any moisture efficiently away so you stay dry throughout. Built to flex with you, this top feels unrestrictive yet durable. Effect by Odlo treatment gives you natural anti-odour properties and optimal climate comfort all day long. Meanwhile, an ultra-soft hand feel means you’ll have a soft layer next to your skin for extra comfort when you’re focussed on the next run down. 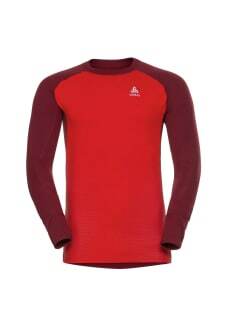 Enjoy active, warm and dry technology this winter in the Active Revelstoke Warm SUW long sleeve crew neck top for men.